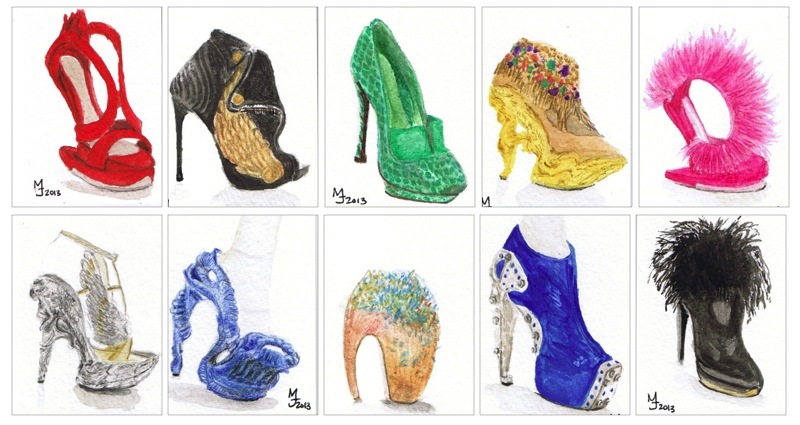 I decided to make use of the pack of Strathmore watercolor papers I got from the symposium to practice watercolors and drew a couple iconic shoes by the late Alexander McQueen. I've always been fascinated by his creativity and ability to push the envelop when it comes to shoes. It's also interesting to see who wears them outside of the runway and what kind of outfit they wear with it. Lady Gaga is the one that brought this designer to light for me. I first saw his alien shoes (3rd shoe on the second row) on her in one of her videos.